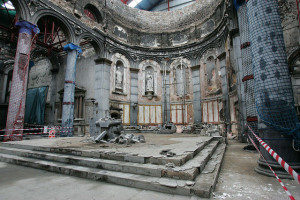 St Mel’s Cathedral Longford after the 2009 fire. Photo Brenda Drumm of CCO. Almost one million euro has been received by St Mel’s Cathedral in Longford in voluntary donations which has enabled the restoration project incorporate disability-friendly lifts and other enhancements. 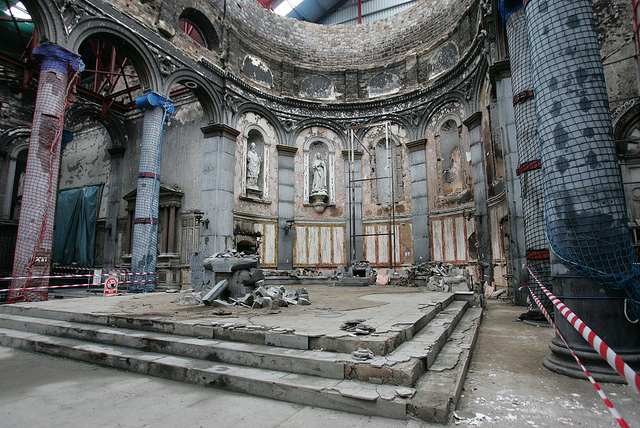 Speaking to CatholicIreland.net, Fr Tom Healy, Administrator of St Mel’s, which was burnt to a cinder on Christmas morning 2009, said there was a great sense of exhilaration that the five-year target was going to be fulfilled this Christmas. In the New Year, another six to eight weeks may be spent snagging and tidying things up but “all told we have met our target,” the priest said. RTE will televise two Masses from St Mel’s this Christmas which will showcase the results of one of the biggest ecclesiastical restoration projects in Europe in recent times. 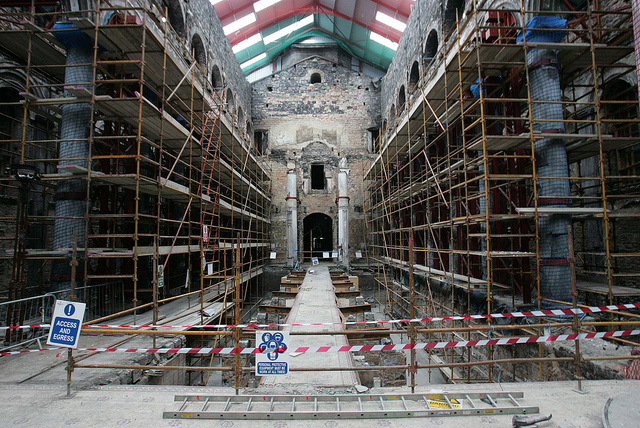 However, under the leadership of Bishop Colm O’Reilly and Fr Healy, along with all the members of the building committee, the art procurement committee, the architects and design team, the contractors and engineers and the Friends of St Mel’s, that initial decision to go down the route of restoration appears to have been an inspired one. Nonetheless, there were many headaches along the way. 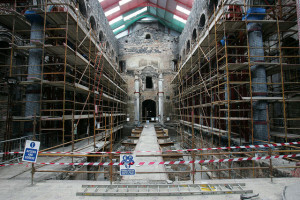 Of the €30m restoration work, Fr Healy explained that for a long time there was a lot of uncertainty as to whether the cathedral was adequately insured to cover this. “To this day we don’t know the final cost until we wrap up final accounts with our builders,” Fr Healy explained. Of the almost one million euro in donations, it has been invested in enhancements to the building, these are improvements to the building which the insurers wouldn’t see it as part of their remit to pay for. 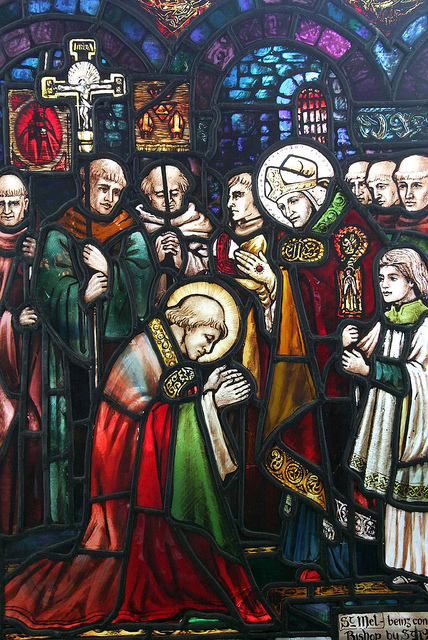 The cathedral this Christmas will also showcase restored Harry Clark stained glass windows. The original windows were scorched and shattered in the fire. 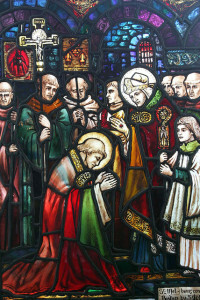 A stained glass image of St Patrick ordaining St Mel which was given to Bishop Colm O’Reilly by President Mary McAleese as a gift the day after the fire will also figure prominently. According to Fr Healy, on the day of the fire, he received texts and emails from people around the world, notably from the US and Australia. It is hoped that some of the people who expressed their concern will tune in for the Christmas services online through ChurchServices.tv (CSTV). High quality digital live streaming of the Christmas services will be of great benefit not just to those confined to home, nursing homes or hospital but also those who cannot return to Longford for this Christmas, he said. For those more comfortable with their TV sets, the live stream will be available on the local Longford town cable TV station – http://www.crossan.ie/index.php/cable-television-overview/ or through a Set Top Box supplied by CSTV. This will mean that wedding and funeral ceremonies can be viewed from anywhere in the world.